JoeZoo Express is a good Google Drive grading tool to use with your students in class. It offers a number of interesting features that include: a rubric builder which allows you to create various interactive and reusable grading rubrics. Using these rubrics you will be able to track students performance in real time and see their level of engagement with your assigned work through generated class charts. 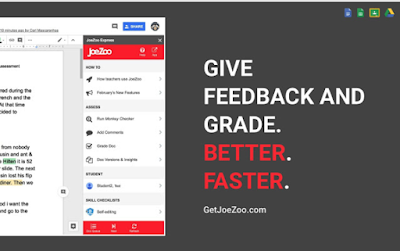 You will also get to grade students work right within Google Docs and JoeZoo will calculate the final grade for you and will automatically organize grades per students and save them to your Google Drive. Another cool feature from JoeZoo Express is Monkey Checker which helps students fix writing errors. With a single click, Monkey Checker ‘scans a doc, colour codes errors and provides a how to fix tip, without auto-correcting.’ The commenting feature included with this add-on enables you to add colour coded comments to the documents you share with your students. Comments are accessible anywhere anytime and they capture ‘before and after versions of docs so its easy to see how students apply feedback.’ You can also draw on generated tag clouds to see which comments you sent to whom and how often. 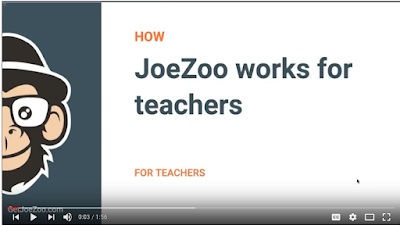 Watch this video playlist to learn more about how JoeZoo works for teachers.